Because of its lower price, laminate flooring is also very simple to install. 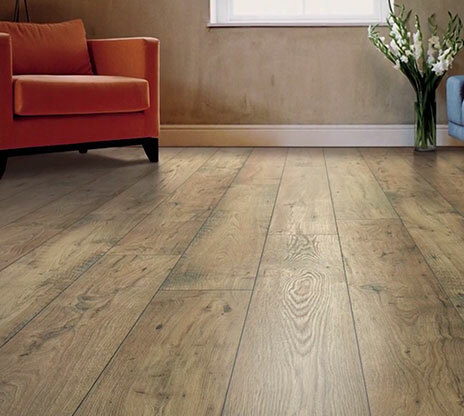 With its tongue and groove click system there isn’t any need for added extras, as laminate flooring floats, meaning it doesn’t need to be glued or nailed down. Because of this, your floor could be installed in a considerably shorter time than other wood flooring, allowing you to focus on other tasks on your to-do list. Like real wood, laminate flooring doesn’t harbour dust, allergens or allergens, making it not only a stylish choice, but a hygienic one too. However, laminate, unlike solid wood flooring, is totally waterproof. This means, that laminate wood flooring can be used in bathrooms, kitchens and utility rooms. This is a great added extra that solid wood cannot offer, and provides you with more options throughout your home. Because of its waterproof properties, cleaning a laminate floor is noticeably easier than other floor types. Laminate flooring is available in a wide range of textures and species, giving you a wide range of choice to mimic real wood. Because of the wide range of laminate, choosing a style and colour to incorporate with your existing home should be easy. With so much choice on offer, laminate flooring proves itself to be a versatile and durable flooring that is perfect for any home.